my-open-irc called at any time either (re)connects to irc and sets up the layout or restores the old buffers. It also saves anything I have been doing before under register ?8 so I can come back to it with C-x r j 8. If you are not aware of this functionality, see the documentation of window-configuration-to-register. 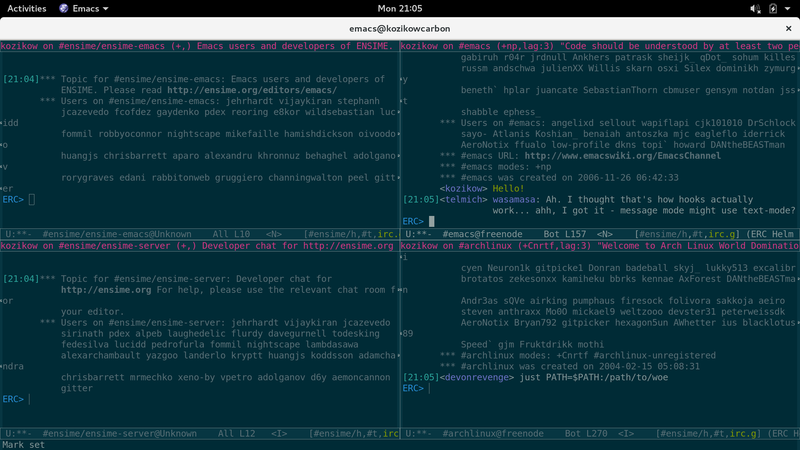 You can think of as my-open-irc as “turn IRC on” and C-x r j 8 as “turn IRC off”, all from within emacs. I have bind the my-open-irc to some key with the global-set-key. It lets me to take a quick glance at “what’s going on”, and if anything appears interesting investigate it further. Code is not of “production” quality, I may clean it up one day if it becomes problematic. I know I shouldn’t hardcode passwords in my .el config, but I do not expose my config and irc is not sensitive. Just add below to your emacs config, add your nick/password in my-open-irc, and call my-open-irc. Joining my take a few seconds, but you don’t need to do anything manually besides calling my-open-irc. "Erc sometimes joins me to random channels lol"
(setq my-irc-joined-count 0) ;; so hack. After all of this I think ERC is more of a library that you implement your own IRC client on, rather than actual IRC client. Erc support for sasl is a bit hacky. Alternative emacs IRC client, circe, supports sasl “out of the box”, but gitter connection was buggy using circe. At that point, I didn’t try out ERC yet, so after a bit of debugging I decided to try out the ERC. Install erc with package-install. erc-sasl is not in any emacs repo, so I prefered to install plain erc to avoid manual updates. From erc-sasl repository, copy just erc-sasl file: https://github.com/joseph-gay/erc-sasl/blob/sasl/erc-sasl.el to your emacs config. In erc-sasl add (require 'erc) and anywhere in your emacs config (require 'erc-sasl). Motivation for such configuration is that erc-sasl is a bit outdated. erc may one day get merged sasl support. Depending only on single erc-sasl file will make it easier to migrate to hypothetical updated erc version. Follow instructions from https://irc.gitter.im/ to get the irc password. Beware that gitter joins you to more channels than I want. Initially, gitter did not auto connect me to any channel after just connecting to the gitter server. When I connected to at least one of the channels it connected me to all channels I ever joined through the website. It caused some bugs in my code running erc-join-hook. To solve it, I simply check if joined channels are in my-erc-channels with (-contains-p my-erc-channels (buffer-name)). I spent at least half an hour trying to make erc-track do what I want. It’s much easier to disable it and do what you want in erc-insert-pre-hook. This hook allows you to get the message and channel name. I use notify package, that lets me send native system notifications regardless of my host operating system and implement my desired filtering using elisp. By default you need to guess when ERC lost connection and reconnect it. my-maybe-reconnect-irc works ok for me, but it sadly does not preserve IRC history. Default line wrapping and timestamps does not work well with windowed IRC layout. I disabled the timestamp “on the right” and disabled the line wrapping. At any time, when I feel like checking out IRC I call the my-open-irc via the keybinding. It either connects, reconnects or opens the existing ERC buffers in 2×2 layout. When I feel like doing some work after chatting on IRC I call C-x r j 8. If there are any notifications, my-open-irc cleans them all (I still have some bug when it leaves some notifications hanging in mode buffer).